Dr. Lupoli joined Allergy & Asthma Specialists of North Florida in 2010. 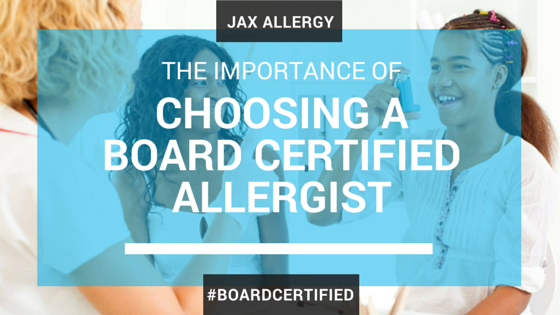 He is board certified by the American Board of Allergy & Immunology–a conjoint board of the American Board of Internal Medicine and American Board of Pediatrics. Dr. Lupoli graduated from the University of Florida with bachelor degrees in Microbiology & Cell Science and Human Nutrition. He attended medical school at A.T. Still University-College of Osteopathic Medicine. His medical residency training in internal medicine was performed at the University of South Florida where he cared for patients at Moffitt Cancer Center and Tampa General Hospital. Dr. Lupoli then completed fellowship training in allergy, asthma & immunology at the University of Missouri-Kansas City (UMKC) where he also served as Clinical Instructor for the UMKC College of Medicine. Much of Dr. Lupoli’s fellowship training was spent providing state-of-the-art pediatric allergy/immunology care at the renowned Children’s Mercy Hospital & Clinics in Kansas City — which serves as a major pediatric referral center for complex allergic and immunologic conditions. Dr. Lupoli specializes in providing quality allergy and immunology care for children and adults. He is well-known by his patients to have an exceptionally positive and friendly bedside manner while consistently delivering the most current, evidence-based care for his patients. Dr. Lupoli is also known to be a teaching-physician who stresses patient education at every appointment. “Patient education is absolutely crucial to the healing process,” says Dr. Lupoli. “By helping our patients better understand the causes and triggers for their conditions they are much better equipped to care for their symptoms in the long run.” His clinical interests include environmental allergies, food allergies, difficult-to-control asthma, and urticaria (hives). Dr. Lupoli is past president of the Florida Allergy, Asthma & Immunology Society. He serves as the section Chief of Allergy & Immunology at Baptist Medical Center-Jacksonville and is a past section Chief of Allergy & Immunology at St. Vincent’s Medical Center-Riverside. He also serves as a clinical preceptor for Nova Southeastern University-Jacksonville. He is a regular speaker at physician programs instructing other physicians about the management of allergic and asthmatic conditions. Throughout his training, Dr. Lupoli was involved in scientific research investigating atypical routes of food allergy exposure and assessment of indoor allergen levels in schools. He is the author of several well-received medical journal publications and is an active member of the American Academy of Allergy, Asthma, & Immunology and the American College of Allergy, Asthma & Immunology. Dr. Lupoli grew up in Neptune Beach and is a graduate of Bishop Kenny High School. He enjoys fishing, skiing and hiking but most enjoys spending his free time with his family. A doctor of osteopathic medicine (D.O.) is a completely trained and licensed physician who has graduated from a U.S. osteopathic medical school. A doctor of medicine (M.D.) is a physician who has graduated from a U.S. allopathic medical school or foreign medical school. Both DOs and MDs are fully qualified physicians licensed to prescribe medications, care for hospitalized and critically-ill patients and perform surgery. Currently, 1 in 4 U.S. medical students attend an osteopathic medical school and there are over 100,000 DO’s in practice. The primary difference between osteopathic and allopathic doctors is that DO’s typically receive additional medical school training dedicated to the musculoskeletal system, physical medicine and osteopathic manipulation therapy. Osteopathic physicians are trained to listen and partner with their patients to help them restore health and stay well. DO’s practice a whole-person approach to patient care that recognizes the inseparable mind, body and spirit component in the healing process.